Stats are the lifeblood of baseball. However sometimes all those statistical terms and abbreviations can get a little confusing. But, have no fear, we’ve put together a pretty comprehensive glossary of baseball statistics. Below you will find traditional batting statistics, pitching statistics and fielding statistics. Number of games played (G) A hitter is credited for a game as long as he takes the field, bats, or as announced as a batter. Plate appearances (PA) Number of times in the batters box, total. At-bats (AB) Number in the batters box, excluding walks, hit by pitch, sacrifices and catcher interference. Runs Scored (R) The number of times the batter scored a run. Runs Batted In (RBI). A batter earns an RBI when a runner scores due to his hit, walk, being hit by pitch and any infield out that doesn’t result in a double play. Double (2B) Any hit that allows the batter to reach second base without aid of an error. Triple (3B) Any hit that allows the batter to reach third base without aid of an error. Home Run (HR). Any hit that allows the batter to circle the bases without error. Grand Slam (GS) Any hit that allows the batter to circle all the bases without error when there was a baserunner on each base. Base on Balls, also called a “walk.” (BB) Awarded to baserunner upon being pitched a fourth ball in an about. Intentional Base on Balls also called an “intentional walk (IBB) IBB is a BB in which the pitcher has no intention of pitching the ball over the plate, essentially awarding the batter a free base. Stolen Bases (SB) Occurs when a base runner advances to the next base as the pitcher delivers the ball. Caught Stealing (CS) When a base runner is thrown out stealing a base. Strikeouts (SO) Number of times the batter reaches three strikes during a plate appearance. Sacrifice Hits (SH) A batted ball hit that advances the baserunner at the cost of being put out. Note: not all bunts are SH. To be credited with a SH the original intent of the bunter must by to advance a runner, not bunt for a base hit. Sacrifice Fly (SF) A fly ball with less than two outs that allows baserunners to tag up and score. Hit by Pitch (HBP) When a batter is stuck by a pitch he is awarded first base. Total Bases (TB) To calculate total bases add singles plus (2x) doubles plus (3x) triples plus (4x) home runs. On Base Percentage (OBP) The percentage of a player’s plate appearances resulted in him reaching base safely. 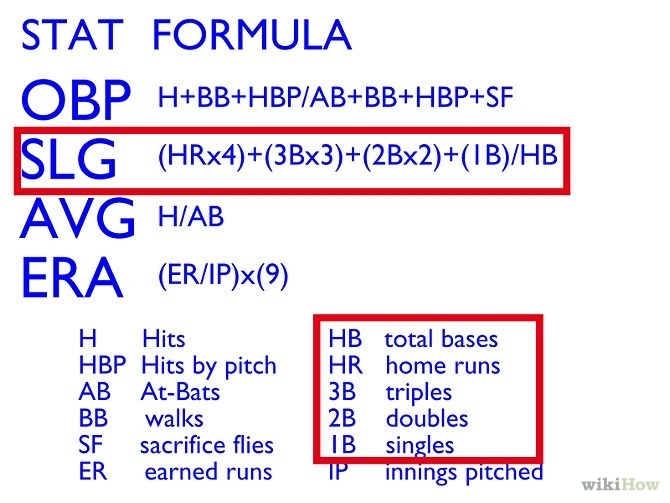 OPB is calculated by adding hits, base on balls and HBP and dividing that by a player’s plate appearances. Slugging Percentage (SLG) Slugging Percentage is calculated by dividing total bases by total at-bats. On Base Plus Slugging Percentage (OPS) Calculated by adding OPB to SLG. Games Started (GS) Games in which a pitcher throws the first pitch. Innings Pitched (IP) Total innings pitched. Batters Face (BF) Total batters faced. Wins (W) The winner pitcher is the player who pitched the half-inning before his team took the lead. To qualify as a winning pitcher the pitcher who started the game must pitch at least five innings. There is no such restriction for the pitchers who follow the starter, although the official scorer does have some discretion in awarding the win in games in which the starter doesn’t go five inning. Losses (L) Goes to the pitcher responsible for the run that puts the opposing team ahead for good. Winning Percentage (W%) The number of wins divided by total decisions. Earned Run Average (ERA) Calculated by dividing the number of earned runs allowed by the number of innings pitching and multiplying it by nine. Complete Games (CG) When a player throws the first and last pitch for his team. Shutouts (SHO) A complete game in which the opposing team didn’t score any runs. Saves (S) According to Rule 10.19 of the Official Rules of Major League baseball a pitcher gets a save if he finishes a game won by his team, he is not the winning pitcher and he is credited with at ⅓ of an inning pitched. Furthermore, he must satisfy one of the following conditions: (1) He enters the game with a lead of no more than three runs and pitchers for at least one inning (2) He enters the game, regardless of the count, with the potential tying run either on base, at or no deck. (3) He pitches for at least three innings. Blown save (BS) When a relief pitcher relinquishes the lead in a save situation. Earned Runs (ER) The number of runs scored without the aid of an error, catcher’s interference or a passed ball allowed by the pitcher. Runs Allowed (R) Total number of runs allowed when the pitcher was on the mound. Home Runs Allowed (HR) Total number of homeruns allowed when the pitcher was on the mound. Base on Balls (BB) Total number of walks issued by the pitcher. Strikeouts (SO) total number of times a pitcher struck out a hitter. Wild Pitches (WP) A pitched ball that alouds the catcher and allows a baserunning to advance which the official scorer pins on pitcher, rather than catcher, error. Holds (H) Awarded to a relief pitcher who doesn’t finish the game but otherwise meets all the criteria of the save rule. Strikeouts to Walk Ratio (K/BB) Strikeouts divided by balls. Strikeouts per 9-innings (K/9) Calculated by multiply total number of strikeouts by nine and then dividing by innings pitched. Walks per 9-innings (BB/9) Calculated by multiplying total number of strikeouts by nine and then dividing by total innings pitched. Putouts (PO) The number of putouts a fielder makes. Errors (E) When the official scorer rules a players fielding blunder results in a hitting not making an out or a baserunner taking an extra base. Chances (C) Calculated by adding putouts and assists. Total Chances Per Game (TC/G) Total chances divided by games played. Fielding Percentage (FLD%) A fielders assists plus putouts divided by assists plus putouts plus errors. Double plays (DP) Total number of double plays which a fielder was a part of. Catcher’s Caught Stealing (CACS) total number of base runners thrown out stealing by catcher.